Today, we’re smoking the Humo Jaguar, released in 2011 as the product of a competition held at the Honduran cigar festival by the same name. Honduran tobacco growers and cigar makers submitted their entries for the competition, and over 200 panelists sampled the blends to select a winner. This year’s winner was blended by Nestor Plasencia and subsequently released into the marketplace by Miami Cigar & Company in the Fall. 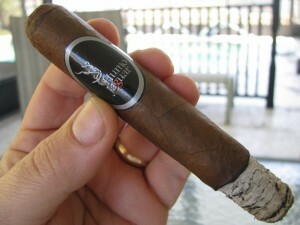 Today’s review is based on a couple of examples, both robustos which have been resting in my humidor since October. 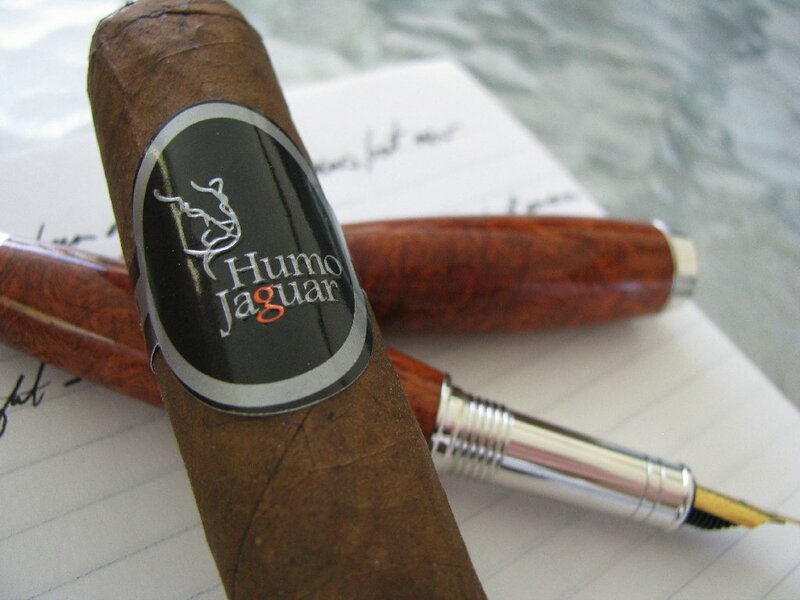 The Humo Jaguar is also available as a Corona Gorda (6X52), and Gigante (6X60). The blend is, of course, a Honduran puro, and the robusto is available in the Tampa market for about $7.35/each in box quantities of 20. So, without further ado, on with the review! The wrapper leaf is quite smooth, and despite a fair amount of chatter about it’s oiliness, my two examples lack any sheen at all. They are supple, but feel very dry to the touch. 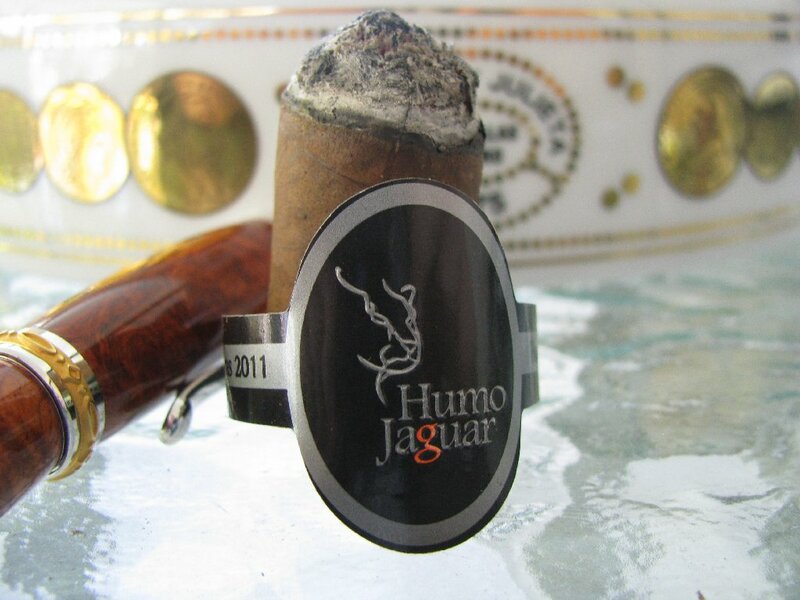 The packaging for the Humo Jaguar calls the wrapper oscuro, but to my eyes they are considerably lighter in color than what I would typically give the name. The pre-light draw is firm but free, and well within the normal acceptable range. It produces a sweet hay flavor on the cold draw. If you happen to be familiar with pipe tobaccos, it actually reminds me of Old Gowrie, a virginia blend by Rattray’s. In fact, it reminds me quite a bit of Rattray’s virginias’ aroma and flavor while unlit. It takes fire very well, and lights easily and evenly with no fuss. The first few minutes of smoking are marked by some spice, and will give a little tickle to the nose upon retrohale. The initial flavors are leathery and sweet – but with a slight tanginess I find pleasant but fleeting. As ridiculous as it may sound, throughout the first inch of the cigar I detect an occasional taste that reminds me of tortilla chips, actually. I only remember making this comparison in two other cigars – the early releases of the Shaggy by Gurkha, and an Indian Tabac cigar (I don’t remember the exact blend – my memory isn’t what it used to be) from back in the days before Rocky Patel had become a household name in cigars. I haven’t had any of his cigars in a very long time, but I have had a few Shaggies and don’t recall coming across this flavor in them for a few years now. Both of my Humo Jaguars burned at a pretty quick clip, although neither turned harsh nor burned hot. I just noticed they seem to be relatively short smokes, even for a robusto. t this would dissipate quickly after a puff or two. The sweetness came back into play toward the end, although not to the extent as the early portions of the cigar. The ash seemed to break more unevenly toward the end, but still kept its rigidity throughout. It tended to break off leaving a jagged edge, rather than cleaving along clean lines. Admittedly, I have not been a huge fan of Honduran tobacco for some time now, tending to smoke more Nicaraguan cigars (and, as always, a goodly portion of my beloved Fuentes from the Dominican). I have enjoyed them quite a bit at different times in the past, and probably will again. While the Humo Jaguar is a good cigar, it isn’t a game changer to me in that respect. I certainly can see the quality of the blend, it just isn’t my “Holy Grail” of flavor profiles. However, if you enjoy Honduran tobaccos, I would not shy away from recommending it to you. The quality of the leaf, as well as the construction and appearance, are superb and certainly worth a try. It is obviously blended and built from good components, and rolled well. Nice review. I like that it carries a pipe tobacco nuance, sounds good. On an unrelated note, I have to know, though, what kind of fountain pen is that? I am a fountain pen nut, too! Looks like a nice one. That was made by an acquaintance of mine on a pipesmoking forum. He only recently began offering up some of his pens for sale. Happily, I managed to get one. He just last week put a few up on a website to raise funds for a mission trip he is planning, but I think most of them are already gone. You can find his site at: http://www.calvarypens.com. It is a great pen – nice heft and feel, and equipped with a Bock nib that does a great job on the paper. I like it a lot. Oh, by the way…the pipe tobacco association stopped prelight. I would stop short of saying the actual smoke was similar. But, it definitely had that Rattray’s “hay” aroma and flavor on the cold draw.